Google's rebrand of the Nexus line is now done and dusted with the official unveiling of the Google Pixel and Pixel XL smartphones. The duo pretty much confirms everything that we knew beforehand thanks to the plethora of leaks. The Google Pixel and Pixel XL are pretty much identical minus the size difference with the same design and components. The duo come in a choice of three colours which Google refers to as "Quite Black, Really Blue and Very Silver" and 32GB or 128GB. The devices are powered by the latest Qualcomm Snapdragon 821 processor and would run Android 7.1 Nougat out of the box. The devices would be the first devices to come with the Google Assistant which trumps other AIs featuring natural language processing courtesy of Google's Deep Mind engine. This would allow users to have a more natural voice interact with their devices. Users would not only be able to ask their devices questions in conversational speech they would also be able to use it to order goods, book an Uber, among others. The fellas at Google also talked up the camera on the Google Pixel and Pixel XL, which is said to have the highest DXOmark rating ever for a smartphone at 89. 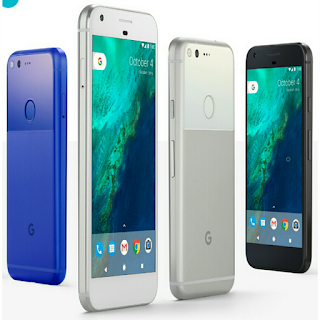 The Google Pixel and Pixel XL would be available for preorder in the US, UK, Germany, Canada and India. Pricing for the Pixel starts at £599 ($649) and the Pixel XL at £719 ($769).